The recent release of the Pilot Elite 95 has raised some brows among those less familiar with the idea of pocket fountain pen, Japan style. This is not the first time pocket pens are revived—five years ago, Pilot replicated the all-steel Myu-701 with some minor differences as the limited edition Pilot M90. The original Myu, let us note, was a very original pen: nib and section are just the same thing, and the reissued M90 could not be mixed up with any other pocket pen. Or, in other words, the new version M90 had one and only one original precedent. Now, with the Elite 95, the situation is different. The original Elite pocket pen was far less original and unique. All three big pen manufacturers in Japan made formal-looking pocket pens and the curiosity raised by the new Elite 95 actually points out at all of those. Sailor even created some models with quasi-inlaid nibs very much alike to those re-made by Pilot. Two Sailor pocket pens with (quasi-)inlaid nibs. The white gold nib of the stripped pen, in detail. It is not perfectly aligned with the section. 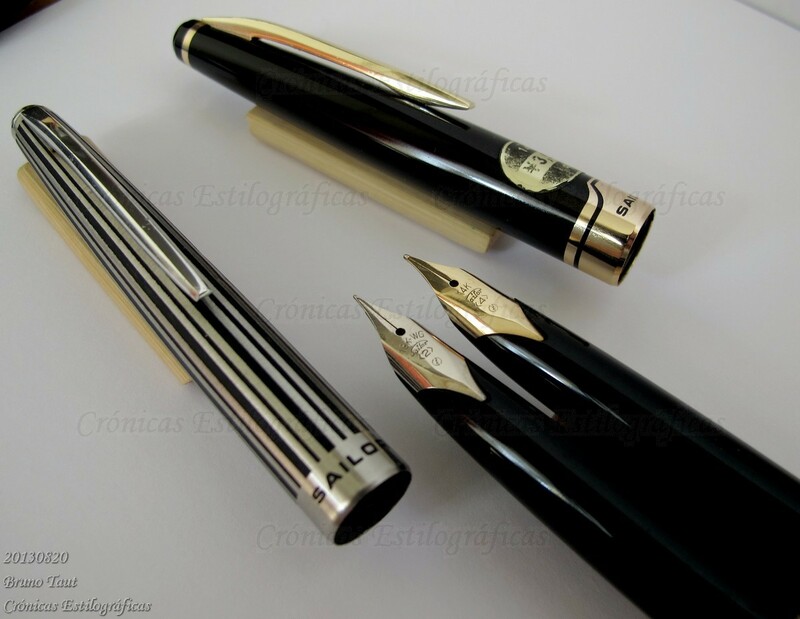 I know of two such models by Sailor: a black pen with a 14 K gold nib, and a black-stripped unit made of steel with an 18 K white gold nib. On both cases, the pen body is metallic. These pens can be equipped with current Sailor converters if shortened. The drawback is a reduction in the already small ink capacity of those. As usual, refilling ink cartridges is a perfectly sensible option. The nibs are geometrically identical, but not so their materials--yellow 14 K (M, number 4) and white 18 K gold (F, number 2). Some Platinum pocket pens worth to revisit in one way or another. In conclusion, this new Pilot Elite 95 created a renewed interest on pocket pens, but it might backfire to Pilot. Would this not be a good chance for Platinum and Sailor to release their own re-issues of pocket pens? 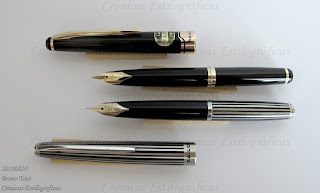 Both brands had very interesting models to copy, and Platinum still produces some of the nibs used on them. And the same goes for this model. 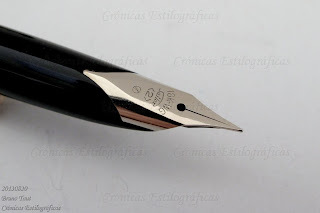 The wingflow nib is still on production. 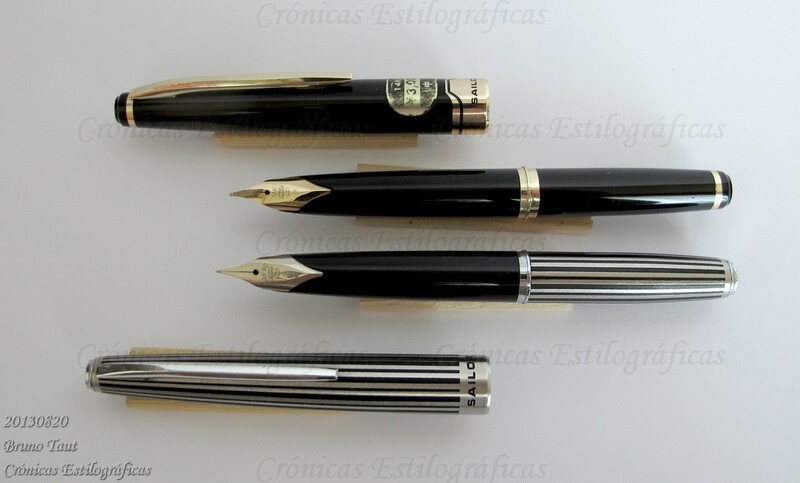 Could you do me the favor of identifying the striped Platinum pocket pens? I am trying to find the model number. Not much can I offer, Erick Langer. I do not have the catalog codes or models. On the label of the pen in the middle (4th picture in the text) it says "PLATINUM STAINLESS". Its nib is made of 18 K white gold.